Finally a new Ruskin Bond this new year! The book was published in October 2016 and I read it today. And yes, Rusty is back! Back with a bang! There has never been any doubt about the goodness of Ruskin Bond's fiction, but I have never read anything so deep in this genre by him. Crime, thriller, paranormal, murders of passion or out of pure evil - a long tired list of topics people try to popularize their novels, stories with, most of the times the trials being honest may be, but disappointing. I was slightly skeptical of what this genre might feel like, but the outcome was lovely. 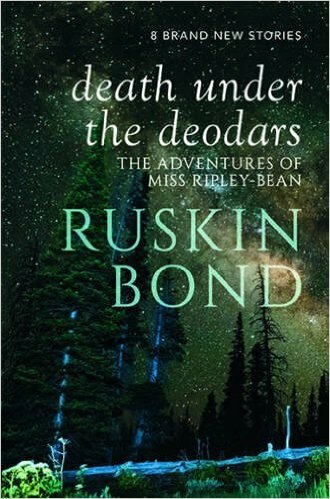 Ruskin Bond has always maintained an image of Mussoorie - a scandalous and promiscuous town sitting in the beautiful lap of the Garhwal Himalayas. This book, nevertheless, is a living epitome of fiction that will sew in your mind deeper threads of such an impression through the experiences of Miss Ripley Bean. Starting from the 1920s and continuing till around 1970s(perhaps), the stories are enchanting. They are the light-reads as Ruskin Bond is famous for but thrilling and captivating. And those readers who have sunk deep in this genre, do not be scared. The endings are not predictable. Rusty manages to surprise us. Aunt May is no Miss Marple but can be her younger sister who gathers material for her and sometimes makes a good call regarding impending judgments. She intelligently guesses what might be happening and how the thread of reason is seeped into the human psychology and their daily natures and preferences. Her observations are light, easy, confident and at peace with herself sometimes even to the extent of being lazy mainly because that is a second nature to her. Her attitude, perspective give you a glimpse of the life in hills during her time and maintains Rusty's perspective that we have known all through these years in a most amusing and new way. Have you ever met him dear?